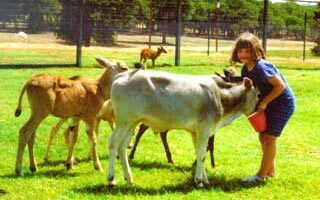 Enjoy the unique, close-up experience of petting, feeding and playing with the friendly animals in The Exotic Resort’s Petting Zoo areas. The types of animals vary based on the time of year and types of babies, but we’ve had anything from baby deer, antelope, zebus, llamas (and others!). Some are to view only, but most of them definitely love all the attention they get from all the children – and grown-ups too! You can also see our pair of porcupines, coatimundi, ring-tailed lemurs and desert tortoise as you make your way through the petting zoo areas. Stay as long as you wish while we’re open, and don’t forget your camera!